This ice hockey team has sharp eyesight and powerful talons just like an attacking eagle and this team is the Colorado Eagles. In just a decade Colorado Eagles have proven to be tough contenders of the game. The title record is really impressive as they have won six divisional titles and two Ray Miron President's Cup. The brawl is on and Colorado Eagles are ready to face off against another tough team. You should quickly get Colorado Eagles tickets and enjoy their action-packed games. Colorado Eagles was founded in the year 2003 by famous ice hockey player Ralph Backstrom who had played for the Montreal Canadiens. The team is headquartered in city of Loveland in Colorado. The Eagles are a part of the East Coast Hockey League and play in the Mountain division of the Western Conference. Colorado Eagles are the double A affiliate of NHL (National Hockey League) team Winnipeg Jets. The home arena of the Eagle is the Budweiser Events Center. This a multi-purpose venue located on 5920 Arena circle in Loveland, Colorado. The venue can seat up to 7,000 spectators. It is also home to the IFL team Colorado Ice. Apart from ice hockey other events like Ringling Bros Circus, Disney on Ice show, Sesame Street Live and WWE have taken place here. Popular standup comedians like Ron White, Bill Cosby and Larry the Cable Guy have performed at the Budweiser Events Center. Colorado Eagles debut in 2003 season was impressive as they topped the division and lost in the conference semifinals. The very next year the Eagles stunned everyone by not just winning the division title but also winning their first ever Ray Miron President's Cup beating Laredo Bucks 4-1. In 2005-06 season they lost in Conference final. The very next year in 2006-0y they again were at the top of the table and win their second President Cup again beating Laredo Buck 4-2. In the next to cups they managed to reach the finals but lost to Arizona Sundogs and Texas Brahms. In 2010-2011 Colorado Eagles were second in the division and went on to play the President Cup once again but this time they lost to Bossier-Shreveport Mudbugs. In 2011-2012 season the Eagles were again second in the division and lost the Conference quarterfinals to Stockton Thunder. Colorado Eagles have not won the President's Cup since 2007 but this season the team is all pumped up to race to top of the table. After going through a major team rebuilding now the morale of the Eagles is quite high and they are bent upon winning all the upcoming games. If you want cheap tickets to the next Eagles game then don't look anywhere just get cheap Colorado Eagles tickets and catch the action live. The average Colorado Eagles tickets price will cost you between $36 and $190, if you are looking for the cheapest seats then catch the event being held at the Rabobank Arena, Bakersfield on 23/04/2019. The average ticket will cost you the highest on 30/04/2019 at the Budweiser Events Center, Loveland. 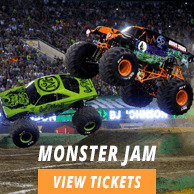 Minimum get in price is for Colorado Eagles tickets is $36 for the event being held at the Rabobank Arena, Bakersfield on 23/04/2019 , there are some venues that have a much higher get in price, for instance the cheapest seats at the Budweiser Events Center, Loveland on 30/04/2019 will set you back $127. How do I get colorado eagles promotional codes? Am I eligible for discount eagles tickets? Everyone is eligible for Colorado Eagles Tickets at discounted rates! Just go through our pages and check out. You can get promotional codes for Colorado Eagles Tickets by logging on to our pages.